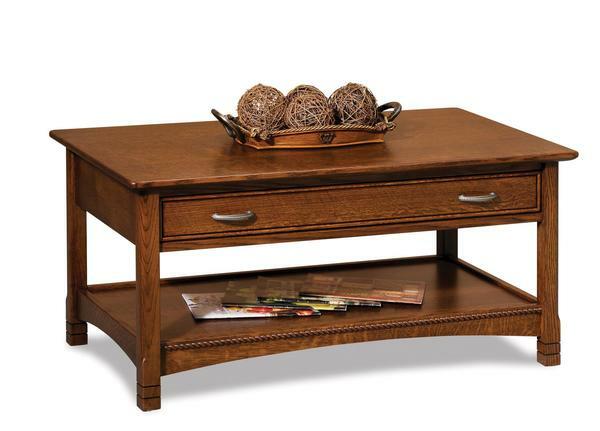 Be delighted by every detail of our Amish West Lake Open Coffee Table with Drawer. Complete with full extension drawers as well as 1 inch solid tops, this coffee table has all of the makings of an essential part of living room enjoyment. You'll be able to easily recognize the amount of care that has been put into every inch of the West Lake. Choose from a variety of solid hardwoods that consist of oak wood, which is standard, brown maple, grey elm, rustic cherry, rustic quartersawn white oak, hickory, quartersawn white oak, hard maple, cherry, walnut, as well as rustic hickory. Each of these materials has been handpicked and sourced from right here in the United States. Our Amish West Lake Open Lift Top Coffee Table offers the same excellent design with the addition of a lift top. Be sure to take a look at the Amish West Lake Open Sofa Table to complete your set today.